Today, my installation notes on the steps I took to get Django set up and running (Mac OS X version still at 10.3.9). so it looks like it should just be a case of adding in MySQLdb and Django itself. MySQL >= 3.23.32: A quick run of status from inside mysql shows my version as 4.1.15, so that's OK.
Python >= 2.3.3: running /usr/bin/python -V just shows "Python 2.3". Thanks to this page, I could run import platform;print platform.python_version() in the Python interpreter and discovered that the built-in version of Python is 2.3.0. Drat. In the MySQL-python-1.2.1_p2 directory, I did a quick chmod +x setup.py and then ran setup.py build. This built very quickly, producing some stuff in the build/ subdirectory. Running sudo setup.py install put things into the /Library/Frameworks/Python.framework/Versions/2.5/lib/python2.5/site-packages directory. I decided to take the Django folks at their word when they claim that the development version is pretty stable, so I checked out the code with svn co http://code.djangoproject.com/svn/django/trunk/ as suggested. (I downloaded in November 2006, at which point the highest stable release was 0.95). From here on, the normal Django documentation can take over. It probably doesn't make a lot of difference, but I would replace the last step with a .pth file pointing to your checked out version of the Django code. 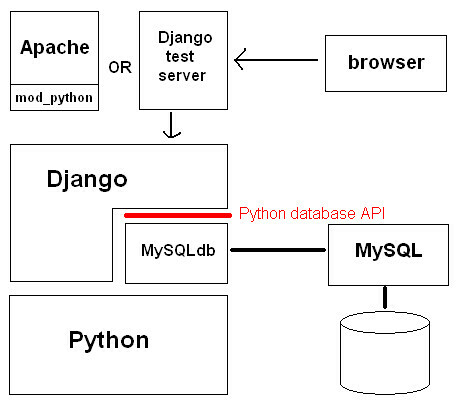 I`d like to play with mysql and python.